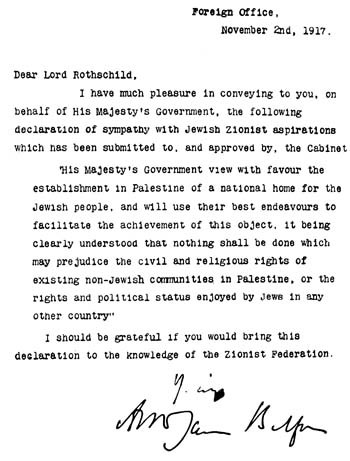 Palestine was among former Ottoman territories placed under UK administration by the League of Nations in 1922. All of these territories eventually became fully independent States, except Palestine, where in addition to “the rendering of administrative assistance and advice” the British Mandate incorporated the “Balfour Declaration” of 1917, expressing support for “the establishment in Palestine of a national home for the Jewish people”. During the Mandate, from 1922 to 1947, large-scale Jewish immigration, mainly from Eastern Europe took place, the numbers swelling in the 1930s with the Nazi persecution. Arab demands for independence and resistance to immigration led to a rebellion in 1937, followed by continuing terrorism and violence from both sides. UK considered various formulas to bring independence to a land ravaged by violence. In 1947, the UK turned the Palestine problem over to the UN. After looking at alternatives, the UN proposed terminating the Mandate and partitioning Palestine into two independent States, one Palestinian Arab and the other Jewish, with Jerusalem internationalized (Resolution 181 (II) of 1947). One of the two envisaged States proclaimed its independence as Israel and in the 1948 war involving neighbouring Arab States expanded to 77 percent of the territory of mandate Palestine, including the larger part of Jerusalem. Over half of the Palestinian Arab population fled or were expelled. Jordan and Egypt controlled the rest of the territory assigned by resolution 181 to the Arab State. In the 1967 war, Israel occupied these territories (Gaza Strip and the West Bank) including East Jerusalem, which was subsequently annexed by Israel. The war brought about a second exodus of Palestinians, estimated at half a million. The Security Council in resolution 242 formulated the principles of a just and lasting peace, including an Israeli withdrawal from territories occupied in the conflict, a just settlement of the refugee problem, and the termination of all claims or states of belligerency. The 1973 hostilities were followed by Security Council resolution 338, which inter alia called for peace negotiations between the parties concerned. In 1974 the General Assembly reaffirmed the inalienable rights of the Palestinian people to self-determination, national independence, sovereignty, and to return. The following year, the General Assembly established the Committee on the Exercise of the Inalienable Rights of the Palestinian People and conferred on the PLO the status of observer in the Assembly and in UN conferences. In June 1982, Israel invaded Lebanon with the declared intention to eliminate the PLO. A cease-fire was arranged. PLO troops withdrew from Beirut and were transferred to neighboring countries. Despite the guarantees of safety for Palestine refugees left behind a large-scale massacre took place in the Sabra and Shatila camps. In September 1983, the International Conference on the Question of Palestine (ICQP) adopted the following principles: the need to oppose Israeli settlements and Israeli actions to change the status of Jerusalem, the right of all States in the region to existence within secure and internationally recognized boundaries, and the attainment of the legitimate, inalienable rights of the Palestinian people. In 1987, a mass uprising against the Israeli occupation began in the Occupied Palestinian Territory (the intifada). Methods used by the Israeli forces resulted in mass injuries and heavy loss of life among the civilian Palestinian population. In 1988 the Palestine National Council meeting in Algiers proclaimed the establishment of the State of Palestine. A Peace Conference was convened in Madrid in 1991, with the aim of achieving a peaceful settlement through direct negotiations along 2 tracks: between Israel and the Arab States, and between Israel and the Palestinians, based on Security Council resolutions 242 (1967) and 338 (1973). The multilateral track negotiations were to focus on region-wide issues such as the environment, arms control, refugees, water, and the economy. A series of subsequent negotiations culminated in the mutual recognition between the Government of Israel and the PLO, the representative of the Palestinian people, and the signing in 1993 of the Declaration of Principles on Interim Self-Government Arrangements (DOP or “Oslo Accord”), as well as the subsequent implementation agreements, which led to the partial withdrawal of Israeli forces, the elections to the Palestinian Council and the Presidency of the Palestinian Authority, the partial release of prisoners and the establishment of a functioning administration in the areas under Palestinian self-rule. The involvement of the UN has been essential both as the guardian of international legitimacy and in the mobilization and provision of international assistance. The 1993 DOP deferred certain issues to subsequent permanent status negotiations, which were held in 2000 at Camp David and in 2001 in Taba, but proved inconclusive. 2000-present: Second intifada, separation wall, Road Map, etc. The visit by Ariel Sharon of the Likud to Al-Haram Al-Sharif (Temple Mount) in Jerusalem in 2000 was followed by the second intifada. Israel began the construction of a West Bank separation wall, located mostly within the Occupied Palestinian Territory, ruled illegal by the International Court of Justice. In 2002, the Security Council affirmed a vision of two States, Israel and Palestine. In 2002 the Arab League adopted the Arab Peace Initiative. In 2003, the Quartet (US, EU, Russia, and the UN) released a Road Map to a two-State solution. An unofficial Geneva peace accord was promulgated by prominent Israelis and Palestinians in 2003. In 2005, Israel withdrew its settlers and troops from Gaza while retaining control over its borders, seashore and airspace. Following Palestinian legislative elections of 2006, the Quartet conditioned assistance to the PA on its commitment to nonviolence, recognition of Israel, and acceptance of previous agreements. After an armed takeover of Gaza by Hamas in 2007, Israel imposed a blockade. The Annapolis process of 2007-2008 failed to yield a permanent status agreement. Escalating rocket fire and air strikes in late 2008 culminated in Israeli ground operation “Cast Lead” in Gaza. The UN Security Council adopted resolution 1860. Violations of international law during the Gaza conflict were investigated by the UN (“Goldstone report“). The 2009 PA programme to build State institutions received wide international support. A new round of negotiations in 2010 broke down following the expiration of the Israeli settlement moratorium. In 2011 President Mahmoud Abbas submitted the application of Palestine for membership in the UN. UNESCO admitted Palestine as a Member. Exploratory Israeli-Palestinian talks were held in early 2012 in Amman. In November another cycle of violence between Israel and Gaza concluded with an Egyptian-brokered cease-fire. On 29 November 2012 Palestine was granted non-member observer State status in the UN. The General Assembly proclaimed 2014 an International Year of Solidarity with the Palestinian People. A new round of negotiations begun in 2013 was suspended by Israel in April 2014 following the announcement of a Palestinian national consensus Government. Another round of fighting between Israel and Gaza took place in July-August 2014. In 2016 the Security Council adopted resolution 2334 on settlements.